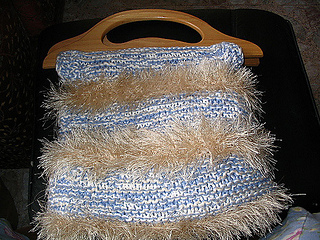 Knit a garter stitch square with bulky wool and novelty eyelash yarns, attach wooden handles, and go to town with this great purse. make it bright or neutral to go with all of your outfits. Tuck in your knitting and you’re set to go. Note: Yardage includes enough for both the super bulky solid and novelty yarns. You will need 250 yds. of the super bulky solid yarn and about 100 yds. of one or more novelty eyelash yarns to coordinate. Gauge is not critical.